Home BUSINESS EMPOWERMENT President Uhuru impressed by Thika Youth Potato project. President Uhuru impressed by Thika Youth Potato project. President Uhuru Kenyatta having a light moment with Thika Town MP Eng. Patrick Wainaina and Kiambu Women Rep. Gathoni Wamuchomba at the Jungle Investors' stand in Ndumberi Kiambu. 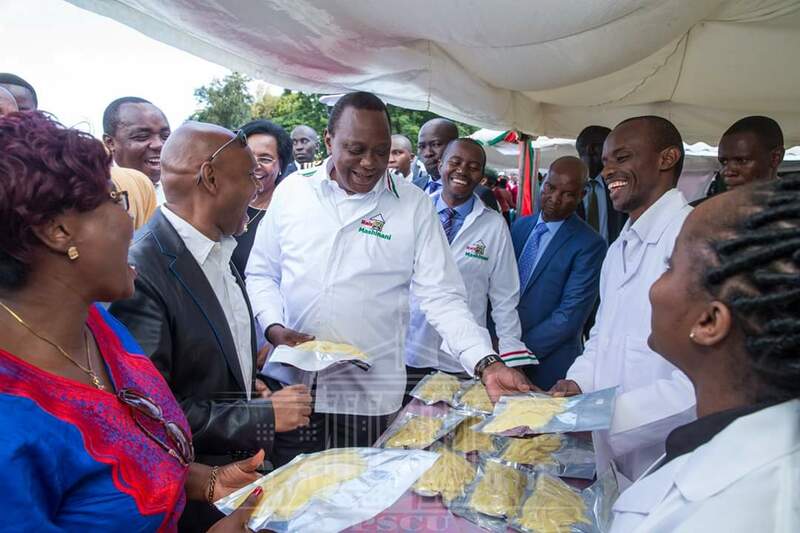 President Uhuru Kenyatta was on Wednesday very impressed by a potato value addition project by some Thika youth who participated in the young start-ups exhibition at Ndumberi Kiambu when he was officially launching the “Huduma Halisi” programme. He spent about 10 minutes asking questions and digging the facts about the youngsters’ project about the project where he acknowledged that it was with similar initiatives that his government could achieve two of his pillars namely manufacturing which leads to job creation as well as food security. The president promised to support the group with Ksh. 5 million to do a cold-room. To juice it up, the Ministry of Youth has also promised funding at various stages. The group that comprises of 28 youngsters from Thika is a beneficiary of the Jungle Empowerment Programme under the stewardship of Thika Town MP Eng. Patrick Wainaina that is geared towards economically empowering the community. Though in its piloting stage, the group has already employed the 28 youth and bear a very ambitious goal of employing a workforce of about 300 employees once it is fully fledged. The company sources potatoes from Nyandarua County during peak season when produce is cheapest. Once the produce reaches their plant located in Makongeni’s Phase 13 area, the potatoes are first cleaned and then peeled. The next stage involves slicing them into a variety of shapes and sizes before they are saline treated, dried and vacuum packed. All these processes are semi-automated. This treatment enhances the potato’s shelf-life and can remain fresh for about twelve months. According to the members, the returns are attractive. Among other projects, Jungle Foundation has a pretty successful “Mayai Monday” with a value chain starting from Hatcheries with Clusters selling chicks to the fellow clusters, production of kienyeji hens, and finally eggs for primary schools within Thika Town Constituency. Seedlings project supports clusters to realise the country's 1 million macadamia seedlings a year dream.